Bristol Street Motors Ford Shirley is supporting local ice hockey team, the Solihull Barons, as they look to continue their unbeaten run to 35 games. The support from the dealership has helped the team with general running costs and Bristol Street Motors Ford Shirley logo will feature on the team shirts. Solihull Barons compete in the National Ice Hockey League Laidler Conference. They play their games at Solihull Ice Rink also known as Blue Ice Plaza. Ice hockey has been played in this country for 100 years and at Solihull for almost 50 years. Back in 1936 the GB men's team won Olympic Gold. In the modern era, the current Solihull team has now gone unbeaten for over a year and are looking to move up a division next season. They are currently sat on top of the league averaging almost 10 goals a game. Simon Priest, General Manager of Bristol Street Motors Ford Shirley, said: "We are very proud to be associated with such a successful and well respected ice hockey team. Sport is an important part of the local community and the Solihull Barons have a very loyal fan base which we are happy to be a part of. "Everybody here at Bristol Street Motors Ford Shirley wish the Solihull Barons the best of luck this season." John Butler, Chairman of Solihull Barons, said: "We are really grateful for the support from Bristol Street Motors Ford Shirley. Sponsorship is an integral part of our success and this partnership will support us with the running costs of the club. 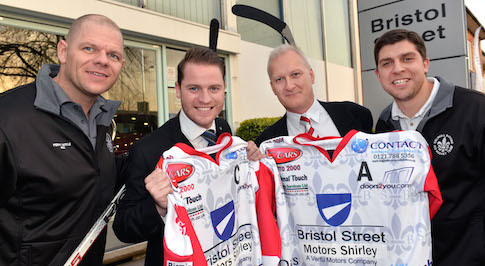 "We are proud to be supported by a range of local businesses, including Bristol Street Motors Ford Shirley, whose badge will be carried on the front of the Baron's shirts."